Because of its proximity to Moscow, the small town of Dmitrov found itself caught up in several battles for the capital. Dmitrov, one of the most prosperous of medieval Muscovy’s secondary towns, was fated to play a role in some of the most dramatic episodes in 20th-century Russian history. Officially, Dmitrov was established in 1154 by Prince Yury Dolgoruky, the founder of Moscow. Archeological excavations near the town citadel, however, indicate the presence of a settlement in distant pre-historic times. Today it’s still possible to see the massive earthen walls dating from the 12th century, which originally supported a wooden fortress with several towers and two main gates. Located north of Moscow on the Yakhroma River, Dmitrov was favorably situated, with access to the vast Volga basin by way of the Sestra and Dubna Rivers. By land, Dmitrov lay on a main route to the northern forests, but it also had links south and east to the major Vladimir principality, for which it served as a fortified border post. During the first two centuries of its existence, Dmitrov experienced constantly changing boundaries of feudal principalities and allegiances. The settlement recovered from the Mongol invasion that devastated Vladimir and Moscow in the winter of 1237-1238, but it was sacked again in 1294 as part of a punitive campaign against the northeastern Russian lands by Tudan, brother of the khan of the Mongol Golden Horde. This vastly destructive invasion was facilitated by warring Russian princes. During the late 13th and early 14th centuries, Dmitrov briefly became the center of its own principality, but it remained within Moscow’s orbit, and in 1364 was formally annexed by its powerful neighbor. In 1382, the town was devastated again, by Khan Tokhtamysh, in retaliation for the victory of Moscow’s grand prince Dmitry Donskoi over a major Tatar-Mongol army at the Battle of Kulikovo in 1380. The final sack of Dmitrov by Tatar-Mongol forces occurred as part of a major raid launched in 1408 by Edigu, who routed Tokhtamysh in 1406 and subsequently founded the Nogai dynasty. The fragmentation of the Golden Horde at this time gave Moscow new possibilities, but also increased the destructive chaos for early 15th century Russia. Dmitrov achieved the height of its commercial power during the 16th century, beginning with the rule of Prince Yury Ivanovich (1505-1533), the second son of Moscow’s Grand Prince Ivan the Great. During this period, the town assumed a pivotal role on a north-south trading axis that extended south toward the Caspian. Dmitrov merchants supplied northern town with grain from the south and in turn, provided Moscow with valuable fur pelts and salt from the north. To get to Dmitrov take the commuter train from Savelovsky railway station in Moscow or the bus #401 to Dmitrov, the bus stop is near Altufyevo subway station. 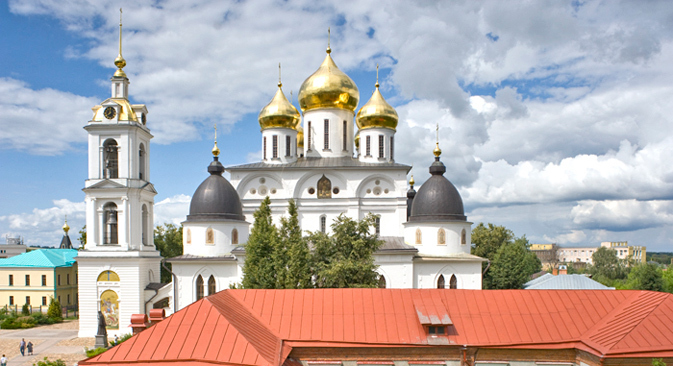 Prince Yury supported the construction of a large masonry cathedral dedicated to the Dormition of the Virgin Mary within the town citadel. Begun in 1509, the brick Dormition Cathedral rested on a limestone base with monumental whitewashed walls in a style similar to the Archangel Cathedral in the Moscow Kremlin. The structure was crowned with five cupolas. Of particular note is 16th-century ceramic relief of the Crucifixion in the middle gable of the south facade. Completed in 1533, the Dormition Cathedral was frequently modified. Its curved gable roof was straightened, and side chapels and a narthex were added in the 18th and 19th centuries. The cathedral interior, with its four massive pillars, has been renovated and now includes a magnificent icon screen. Also completed in the 1530s was an imposing brick church in the Monastery of Sts. Boris and Gleb. Although it has only one cupola, the Cathedral of Sts. Boris and Gleb is similar in design to the nearby Dormition Cathedral. Fortunately, the monastery church has retained its original curved roofline, which follows the contours of the semicircular gables. Unfortunately, the town’s favorable economic situation in the 16th century came to an abrupt end during the chaotic latter part of the reign of Ivan IV (the Terrible). The prince of Dmitrov at this time was Vladimir Andreevich (Staritsky), grandson of Ivan the Great and the tsar’s cousin. Relations between the two were complex and swung wildly between favor and suspicion on the part of Tsar Ivan. After Vladimir was accused by courtiers of plotting to poison Ivan, Vladimir was forced to take poison in 1569. Many of his relatives were subsequently killed, yet Vladimir himself was buried with honor in the Kremlin’s Archangel Cathedral. After Ivan the Terrible’s death in 1584, Dmitrov’s position improved little during the reign of his son Fyodor, who died without heirs in 1598 as the last of the Rurikid dynasty. And further tribulations lay ahead for the town. With the death of Tsar Boris Godunov, in 1605, Russia was plunged into a destructive interregnum known as the Time of Troubles. In January 1610 Dmitrov was taken by Jan Piotr Sapieha (1569-1611), a leading commander of Polish-Lithuanian forces. Sapieha burned the wooden fortress above the great earthen ramparts, but he was compelled to abandon the town after a defeat in February. Despite this small victory, years of destructive fighting lay ahead. Even after the establishment of the Romanov dynasty in 1613 and a return to a semblance of order, Dmitrov remained only a shadow of its former self. During the 17th century, the town gradually recovered to become a regional trading and administrative center. In the 18th century, Dmitrov was graced with the construction of brick parish churches, a number of which survive. Like many such towns, it gained a more regular plan in 1784 as the result of policies implemented during the reign of Catherine II (the Great). During the Napoleonic invasion of 1812, the proximity of Dmitrov to Moscow placed it in the war zone. On Sept. 29, 1812, a large detachment of French troops occupied Dmitrov and proceeded to ransack the center. Dmitrov was rescued by the movement of a contingent of Russian forces from nearby Klin, and the French hastily withdrew on Oct. 1. In gratitude the town's merchants erected the Church of the Purification, completed in 1814 and now impressively restored. Although much of the center of Dmitrov has been transformed by construction over the past century, a number of interesting wooden houses from the 19thand early 20th centuries remain. Among them is the house of Mikhail Olsufyev, which served as a residence for the venerated social philosopher and anarchist Prince Pyotr Kropotkin (1842-1921) in the final years of his life. With the advent of Soviet power, Dmitrov maintained its position as a modest regional center in the shadow of Moscow. But in the early 1930s, the town suddenly found itself at the center of one of the most important projects of the first Five-Year Plan. Faced with a looming water shortage for Moscow, the Central Committee in 1931 decreed the construction of a canal linking the Volga and Moscow Rivers to the north of the capital. In 1932 the planned route of the canal included a segment of the Yakhroma River, which was to be channeled straight through the town of Dmitrov. Intending to reduce costs and with limited technology, the Soviet government turned to the massive use of concentration camp labor. During the five years of construction, hundreds of thousands of Gulag laborers along the canal were supervised from the headquarters of Dmitrovlag, located at the former Monastery of Sts. Boris and Gleb. The grim drama of the canal continued in the fall of 1941 during the Battle of Moscow. Toward the end of November, German forces attempted to cross the canal near Dmitrov as the northern part of a giant pincer movement to surround Moscow. The height of action began on Nov. 27. Although shelled by the Germans, Dmitrov itself was not captured, but the settlement of Yakhroma, just to the south, was briefly occupied. Over the following week, this area around the canal became the focus of a desperate, heroic struggle during which the Germans were driven back. By Dec. 11, 1941 all of the Dmitrov region had been liberated, one of the critical initial steps in the first major victory over the Wehrmacht on the eastern front. In memory of its role in these dramatic events, Dmitrov was designated a national “City of Military Glory” in October 2008. Today Dmitrov is a prosperous regional center (population 66,000) benefiting from steady growth on the fringes of Moscow. Easily accessible by road and rail, this attractive and hospitable town has preserved a broad range of cultural monuments—above all its citadel and cathedral—that have major significance for Russian history.